In the IDC there is also time for FUN!! Yesterday we spent a morning in the company with our own Full Cave Instructor Alain Pocobelli. He gave a great presentation on tec diving and demonstration of diving techniques in the pool. Afterwards it was the IDC candidates turn to feel what it’s like to be diving “tec”. The session was a huge success and I think we have some new to be cave and tec divers in the course. Pro Dive Mexico November IDC entering the second week! All the candidates are doing great and their performances are nearly perfect. 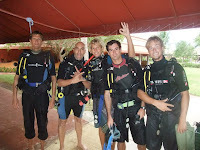 On Friday the 3rd of December they will go to the PADI Instructor Examination and represent Pro Dive Mexico. All of the candidates have the full support from our staff and fellow instructors. We wish you all the best at the examination this weekend. Stay tuned for more pictures and updates from the IDC. As PADI and Body Glove united Divers and surfers in Fiji last month. 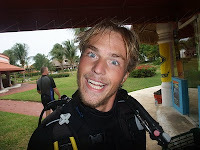 This time Pro Dive Mexico and Morph kiteschool at Catalonia Playa Maroma and Catalonia Royal Tulum in Mexico followed up. Young passionate kite professionals are combing the trilll of Kiting with the passion of scuba diving. A new way of living and exploring the Caribbean over and under the waves !! After 2 days of prep the Pro Dive Mexico Instructor Candidates are now ready for the IDC. Tomorrow Friday we kick of the last IDC of year. Follow us here on the blog and also look for dailey photos and updates on Facebook. See our pictures from the 2 days up to the IDC here. Another great day in the Riviera Maya! Today in the DMRSP we took a field trip to the famous cenote Tajma-Ha. The cenotes and caverns are located throughout the our jungle in an ancient underwater river system to which we have access to over 700 kms of explored diving areas. 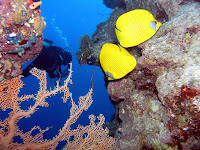 Nowhere else in the world can you enter such magnificently decorated and spiritually sensitive areas that open a whole new realm to your diving ability and experience. Cenote Tajma-Ha has much to offer for both Cavern and Cave Divers, is situated just south of Playa del Carmen near Puerto Aventuras. The dive takes the diver from the entrance into a wide room underneath an air filled bat Cave. Here light enters through holes in the ceiling and penetrates the water like laser beams during the summer months. Along the Cavern floor you will find hundreds of stalactites lying in the sediment. Continuing the dive you enter the sugar bowl, a second small Cenote where you can see an amazing light show on Sunny Days. Tajma-Ha is decorated with stalactites, stalagmites and plenty of hidden fossils can be spotted if you look for them. Haloclines in the deeper areas create interesting mirror like effects as divers penetrate the layer of salt water, which is below the fresh water.